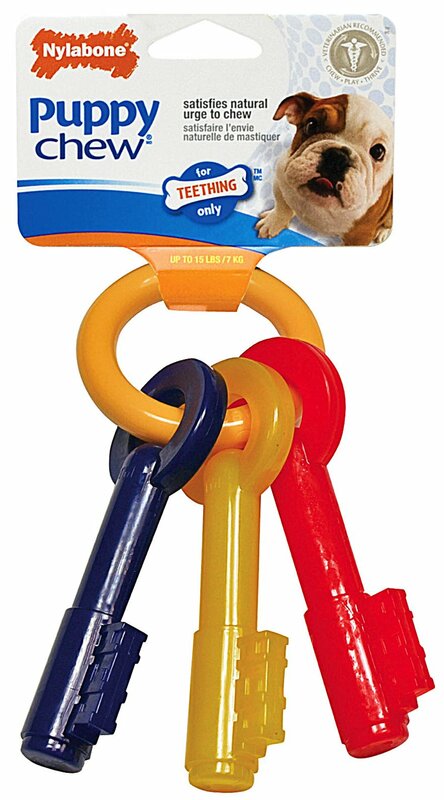 Nylabone Puppy Teething Keys have been specifically designed for young puppies to aid in the growth and development of their teeth and gums. They are also used to encourage safe and non-destructive chewing. During normal chewing small bristle-like projections will be raised on the keys which will help clean teeth and massage gums. This not a consumable product but small shavings (no larger than grains of rice) should pass through without effort. This product should not be used by a dog with any of its adult teeth. There are currently no questions for Nylabone Puppy Teething Keys - be the first to ask one!